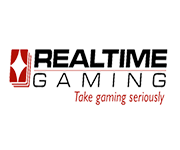 Realtime Gaming also known as RTG, has been established since 1998. Based in Costa Rica and having several other offices around the globe, RTG tries to offer full support to their clients. Started off with Flash and download online casino but has kept a good pace in offering some of their games on mobile casino which are compatible with most mobile devices. Many of the casinos that offer RTG games are US friendly and are also known to be very generous with bonuses. Tell us more about your experience if you have played in any of the casinos listed below.